Christiansted, USVI – The all-female Team Cane Bay VI, sponsored by St. Croix-based financial consulting firm Cane Bay Partners LLLP, came in third place overall in the Seventh Annual Scenic 50 Race spanning Christiansted and Frederiksted, from sea level to 900 foot elevation, Cane Bay Partners Co-CEOs Kirk Chewning and David Johnson announced Monday. The race took place on Sunday, Jan. 24 and began in Christiansted heading west to Frederiksted and then back east to the finish line on Mermaid Beach at the Buccaneer Hotel. The Scenic 50 included an individual 50-mile run, a four leg 50-mile team relay and an individual 50-kilometer run. Team Cane Bay VI came in third overall and was the first all-female team to cross the finish line in the relay version of the race with a time of 8 hours and 51 seconds. Team members include St. Croix residents Colleen Chin, Esther Ellis, Robin Seila and Julie Sommer. Women in general dominated the race and the first place finisher, Bridget Klein, made a time of 8 hours and 37 minutes. The first male finisher, Mike Klein, came in at 9 hours and 57 minutes. Theresa Harper took over as director on race day so co-directors Bridget and Mike Klein could participate. “The women of Team Cane Bay VI are thankful for the support of Cane Bay Partners, who have put their confidence in us to represent St. Croix in this event, and to shine as an example for the next generation of female athletes,” Sommer said. “This is a great event for St. Croix, providing visitors and residents with an opportunity to enjoy healthy competition while seeing the island’s unique scenic areas,” Cane Bay Partners Co-CEO David Johnson said. 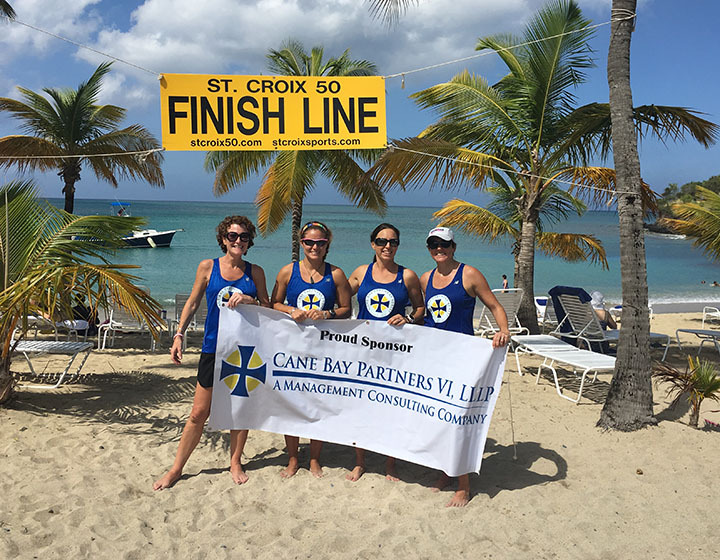 Photo: Team members sponsored by Cane Bay Partners VI, LLLP include St. Croix residents (left to right) Colleen Chin, Robin Seila, Esther Ellis and Julie Sommer pose by the finish line on Mermaid Beach at The Buccaneer.